Regardless of your background in fantasy sports, our NFL and College Football content will help you gain an edge in your contests! Our team of seasoned DFS veterans have the experience and skills necessary to help make you a better and more profitable player! Take advantage of all of our great information as you make your trek to the top of the leaderboard each week! @RussellJClay talks about his top DK defenses for Week 12. Please subscribe to a Premium Content plan to view this video. @JGuilbault11 highlights this week's top defense picks for FD. @RussellJClay chats about some Week 12 pricing across the industry. @FantsyChillPony reviews the Week 11 DK optimal lineup and stack. @JGuilbault11 breaks down @BigItaly42's Week 11 analysis. @ReneeMiller01 sits down with us to breakdown her Week 11 decision trees for NFL lineup building. 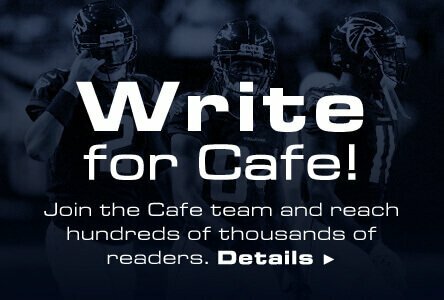 @JGuilbault11 reviews the Week 11 Cafe Value. @JGuilbault11 locks in his favorite GPP and Cash tight ends for Week 11. @RussellJClay highlights his top cash and GPP tight ends for Week 11. @JGuilbault11 reviews the Week 11 FanDuel optimal lineups. @Spencer_JL has highlighted his top GPP & Cash quarterbacks on FanDuel for this week. Lots of running backs to choose from this week, so let @RussellJClay narrow them down for ya. @JGuilbault11 has his eyes on these Week 11 defenses. @JGuilbault11 talks DK quarterbacks for Week 11. @RussellJClay breaks down DK defenses for Week 11. @RussellJClay breaks down some Week 11 salary notes.